Okay, this is fun! I have had such a wonderful time getting to know you all over the past couple weeks. And I’m so thankful I’m part of this blog! What an amazing group of writers and readers we’re collecting. And… I get to think and write about LOVE here. How fun is that??? Yesterday we celebrated romantic love, unrequited love, undying love and all things chocolate. So Happy Belated Valentine’s Day! Today, I would like to spread our net a little wider as it is my grandmother’s 95th birthday and my entire family (there are over 40 of us) is gathered to celebrate alongside her. Isn’t she spectacular? 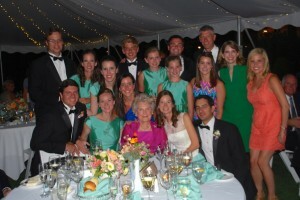 She sits in hot pink surrounded by her grandchildren at my cousin’s wedding a few months ago. There’s a lot of familial love floating around here right now – and yes, there are some sibling rivalries, jealousies and annoyances too – but isn’t that all part of it? It’s another dimension of our reality has humans that makes love so complex, interesting, and inexhaustible as source of motivation and fulfillment both in fiction and in life. In my novel, Dear Mr. Knightley, I adored creating the friendship, tension and attraction between Samantha and Alex. But that wasn’t the only love story in which I invested my time and interest. Sam’s relationships with the Muirs and with Kyle – the love that grew in those interactions – captured me as much, if not more than did her romance with Alex. The Muirs provide Sam with familial love, parental love and, I hope, a glimpse of that unconditional love we all seek. They, in effect, woo her into their family – only giving as much as she can handle when she’s ready, but always present, faithful and available. Two of my favorite lines come at the end of the book. The first comes after Sam has received an emotional blow and feels both betrayed and alone. The professor’s reassurance still makes me teary. Can you imagine, after years of neglect, abuse and abandonment, what Sam must have felt upon hearing and absorbing such words? Okay… I’m getting weepy all over again. 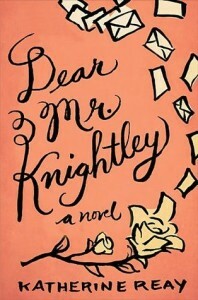 Dear Mr. Knightley also features another love story – and this is just about my favorite. Kyle, a foster kid with a tragic past, offers Sam different view of love – and one that is revealed through sacrifice. At first meeting, he and Sam first loathe each other, but a close sibling-like friendship is forged through common ground (running) and past experiences, most of them painful. At one point in the novel, Samantha is defeated. Nothing she can do can save her and she begins to retreat once again. It is Kyle who steps in and sacrifices his own protections, offering his own vulnerability, to help free Sam from her fears and her past. Her recognition of Kyle’s love still catches my breath. I think, when writing or reading about love, that it is this multidimensionality that makes it so fascinating, complex and rich. We don’t experience love in one form or from one direction – it is woven into our lives, our faith and our stories, in a complex and dynamic way. And when this full aspect of love – in all its many and varied forms – is brought to the page, we experience the most memorable and life changing stories. What a lovely post, Katherine! 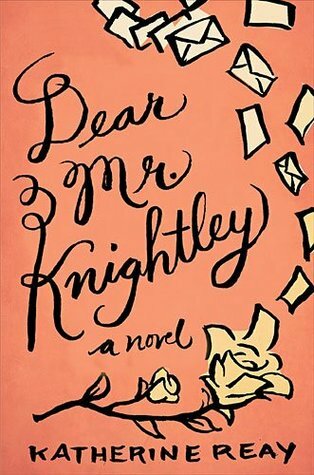 I am eager to read DEAR MR. KNIGHTLEY and after reading the quotes you shared, I know it will be a beautiful, memorable story! Thank you, Britney. And thanks for stopping by!